Recently I was advising a client on building out intranet-style content on SharePoint Online. I walked them through communication sites and modern team sites, demonstrated the mobile-friendly responsive rendering, the ease of editing, and so on. Then came the killer question: "how do I target my navigation links to different users?" This might well be on Microsoft's product backlog... but at the time of writing, there's no support for audience targeting with communication sites or modern team sites. So how do we use targeted navigation without losing the benefits of the modern UI? After a bit of trial-and-error we came up with a working solution using modern pages within classic SharePoint sites. There are quite a few gotchas, hence this post. Step 1: Create a suitable site Create or locate a classic SharePoint site (e.g. using the Team Site - SharePoint Online configuration template). Automating site creation processes with SharePoint workflow has cropped up a lot in this blog over the years. The latest battle has been getting newly-created subsites to inherit the top link navigation bar from the site collection root. At the time of writing, you can't switch on navigation inheritance using the REST API. I've tried, exhaustively. Google agrees. TL;DR: Package versioning in SPFx web parts is confusing. Your sites will notify you that an upgrade is available, but will automatically use the latest version of your code regardless. Package versioning behaviour in the SharePoint Framework is currently a little idiosyncratic, and it recently caused us a few headaches. It seems that from a versioning perspective SharePoint (incorrectly) expects the SPFx packages to behave like SharePoint Add-ins. In this post I'll run through some of the issues we encountered and how we worked through it. The SharePoint package manifest, in the package-solution.json file.The component manifests, in one or more .manifest.json files.The NPM package manifest, in the package.json file. In this post we're looking at the SharePoint package manifest (package-solution.json) as this is the version number that SharePoint reads and propagates when you deploy a package to the App Catalog. Just a quick note (followed by a quick rant) on a recent change to sharing in Office 365 (both SharePoint Online and OneDrive for Business) that's caused us a couple of issues over the last week. 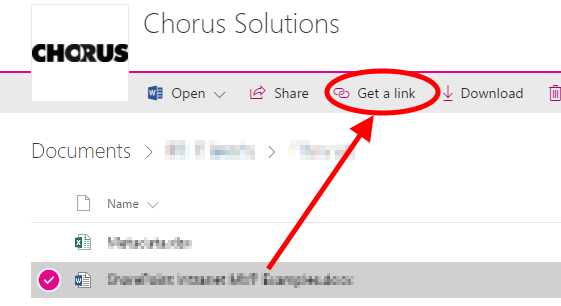 The reason for this is that when you get a link in SharePoint Online (or OneDrive for Business), it now defaults to creating a link that grants anonymous access to the document. If you've locked down anonymous sharing on your site collection, the user will get an error message instead. In the package-solution.json file, make sure your solution name doesn't use dot notation (or for my American friends, doesn't contain periods). This appears to prevent SharePoint from recognising your .sppkg file as a valid app package. The property '__metadata' does not exist on type 'SP.CamlQuery'. Make sure to only use property names that are defined by the type. A couple of years ago, I published a series of posts on getting and setting taxonomy field values in SharePoint workflows by using the REST API in custom workflow activities. These custom activities have served me well, but they've always been unable to work with multi-value taxonomy fields. It's time to fix that.